Pompey are to face Brighton in a behind-closed-doors friendly. But Kenny Jackett is still to learn the standard of opposition they are booked in to face. The Blues are scheduled to travel to the Premier League club’s Lancing-based training ground on Tuesday, July 24. The fixture will take place in the morning – on the same day a Pompey XI take on the Rocks (7.45pm). Jackett is to field his first-team for the Brighton clash. Although he is unsure whether they will face an under-23 side, squad players or regular Premier League performers. He said: ‘We have a behind-closed-doors match on the same day as Bognor. We will be stretching player-wise but are capable of that. ‘We will see the make-up of the opposition when we get closer to the time but I would suggest our first-team will be going to Brighton in the morning and it will be a Portsmouth XI in the evening. ‘We don’t know the opposition but it’s obviously a good chance and an opportunity because as we get into that week everyone will need game time. ‘I have no idea what sort of Brighton team it is, to be honest. It has been arranged quite early – at the back end of last season. ‘It’s a game we are looking forward to. We are going over to their training ground, I am not sure exactly what sort of side or what stage Brighton will be at in terms of opposition. Pompey last faced Brighton in pre-season in July 2012, when Michael Appleton was in charge. It took place on pitches at the Barcelo Montecastillo Resort in Cadiz, during the Blues’ summer tour to Spain and Gibraltar. 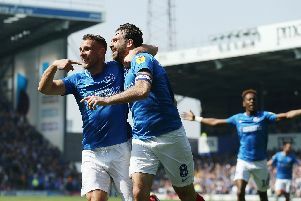 Gus Poyet’s men ran out 5-1 winners, with Dan Thompson netting the consolation for a Pompey team reduced to 10-men following Ashley Westwood’s sending off. Pompey fielded a side of Academy graduates and triallists, with Adam Webster, Jed Wallace, Dan Butler, Liam Walker, Jon Harley and Izale McLeod involved. Jackett’s side are next in action against Moneyfields on Tuesday night, although it will take the form of a Pompey XI. That will chiefly consist of those players who featured in the second half of Saturday’s 2-1 victory over the Hawks. Similarly, while Jackett will field his first team against Brighton, the remaining members of his squad will be present at Nyewood Lane later that day.